Mele Kalikimaka from Kauai! We are spending two weeks on Garden Island. 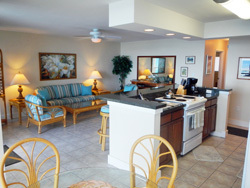 We’re staying in a condo at Kuhio Shores, overlooking the beach. I conducted a fairly extensive email communication with the owner over several months prior to our trip. My regular chair is 24 inches wide without any camber, so I told him I needed all doors to be 32 inches wide or more, and requested grab bars and a shower bench. He assured me that all the doors were all least that wide, and said he would install grab bars and obtain a bench. I asked him for a floor plan, but he did not provide one – I should have insisted. I also tried to talk to him about grab bar placement, and didn’t get very far. I also tried to make sure he understood the difference between the width of the door opening with or without the door, but again, he didn’t listen very well. So here we are. I wound up bringing the off-road wheelchair (which was the right decision). It’s wider, but I’m not sure how much wider (didn’t pack a tape measure in my carryon), but it’s around 27 inches. We had to move a fair amount of furniture to create access within the condo. The bathroom doors are wide enough if you line up exactly straight and don’t let your fingers get in the way. I can’t close the door, and there is practically no clearance between the chair, the cabinets, and the shower. There’s a grab bar in the shower, but there’s no way to reach it. When backing out of the bathroom, I have to take 3 or 4 cuts at a turn before I can get going back down the hallway. So I’d call it minimally accessible – I need assistance to get into the shower, turn on the water, position the spray. I need to brush my teeth and wash my hands sitting sideways. What should I have done differently? Insisted on a to-scale floorplan. Videos and photographs can be extremely deceiving – a fish eye lens will make the tiniest, most crowded room look spacious. It’s not the owner’s fault (except inasmuch as he isn’t a very good listener) – he did what he said he would. Now that we’re here, I’m checking out other properties to see what will work next time. Hope you’re having a great time. Good suggestion to get a floor plan. I noticed some hotels are now putting room floor plans up on their sites to show their “accessible” rooms ( a word that we all know gets bandied about and taken in vain far too many times!) Happy holidays to you and yours. Oooo. I never thought of asking for a floor plan! “Accessibility”… ha. I’ve been burned so many times!